Perhaps the Wodeyar dynasty is the longest and most continuous empire to ever rule howsoever tiny a part of the erstwhile Mysore state, now known as Karnataka. From 1399 when it was established by Yaduraya Wodeyar till 1947—that is, 548 years of near-continuous reign by a single dynasty is really an unparalleled feat. The continuity was broken only for a short but nightmarish spell in the 18th Century. Like any royal lineage, the Wodeyar dynasty too has its share of ups and downs but the overall record is quite excellent. In so long a period, it boasts of an astonishing number of superb statesmen, warriors, administrators, and patrons of art and culture. A short list of the Wodeyar dynasty greats would include Raja Wodeyar, responsible for making Srirangapattana his capital and building its fort. Much of the Mysore kingdom’s expansion occurred during his time. Apart from him, other luminaires include Chamaraja Wodeyar VI, Narasaraja Wodeyar (he epitomized the title Ranadhira Kantheerava—Lion-like hero of the battle –bestowed on him) fabled for his strength, ferocity and wrestling skills, Chikka Devaraja Wodeyar, Narasaraja Wodeyar II, and Krishnaraja Wodeyar III. Krishnaraja Wodeyar III, who was born at Srirangapatna, was the son of Chamaraja Wodeyar IX and his first wife, Maharani Kempa Nanja Ammani. He was the longest ruling Wodeyar king, for nearly 70 years, from 30 June 1799 to 27 March 1868, and laid the foundation on which his successors, chiefly Krishnaraja Wodeyar IV, built, and transformed Mysore into a modern and model state. The credit for making Krishnaraja Wodeyar III the king of Mysore under extraordinarily difficult and dangerous circumstances goes fully to Maharani Lakshmi Ammani Devi, his grandmother. He was Lakshmi Ammani’s adopted grandson, and he was only five when he ascended the throne of Mysore on 30 June 1799. Krishnaraja Wodeyar III’s ascendancy is also significant because he was the first Wodeyar king to resume the rule of Mysore by the Wodeyar lineage after a gap of nearly 40 years. In 1761, a freelance mercenary who was promoted as the general of the Mysore army backstabbed the Wodeyars and usurped the throne of Mysore. Hyder Ali was followed by his son Tipu Sultan who unleashed a reign of terror, savagery, and Islamic fanaticism for about 17 years throughout South India. Tipu kept the surviving members of the Wodeyar dynasty in a state of house arrest, depriving them of even a modicum of dignified existence. On their part, the British honoured their promise. On 30 June 1799, the five-year-old Krishnaraja Wodeyar III was crowned the king of Mysore in a traditional coronation ceremony that took place in a special pavilion constructed near the Lakshmiramana Swamy temple in Mysore. The young boy was led by the Duke of Wellington on his right. Dewan Purnaiah was selected as the Dewan of Mysore. Krishnaraja Wodeyar III attained the age of 16 in 1810, also known as the “age of discretion.” In other words, he was fit to rule independently. After discussing with the British Resident, A. H. Cole, the reins of the state were transferred from Dewan Purnaiah to the new king. However, Krishnaraja Wodeyar III lost his grandmother in the same year. Two years later, in 1812, he also lost Purnaiah. Krishnaraja Wodeyar III’s early years as king witnessed amicable relations with the British. However, relations began to get strained by the 1820s with A.H. Cole alleging financial impropriety, in his letters and reports to the British Governor at Madras, Thomas Munro. Despite an independent investigation absolving the king, things did not improve. This reached a head when a serious insurrection broke out in 1830-31. The British administration at Madras then took direct control of Mysore for about 50 years appointing Commissioners who administered the state. The most famous Commissioner was Sir Mark Cubbon in whose honour the Cubbon Park at Bangalore is named. In a way, the British decision to directly administer Mysore came as a huge boon for Krishnaraja Wodeyar III. Freed from the pains and concerns of administrative matters, he set upon a path that not only transformed Mysore in every positive way imaginable, but bequeathed a legacy that the Karnataka of today continues to enjoy. If the city of Mysore still boasts of being the cultural capital of Karnataka, majority of the credit for it goes to Krishnaraja Wodeyar III. Krishnaraja Wodeyar III was a multifaceted, multitalented genius. He was a polyglot, scholar, an accomplished poet, writer, artist, and musician among other things. He has to his credit at least 50 literary works on various subjects. His Sritattvanidhi (literally: The Illustrious Treasure of Realities) is an encyclopaedic treatise interspersed liberally with iconography. We can only imagine the magnitude of the effort to put together this treatise when we realize the fact that the objective of the work was to collate and combine all available information about the iconography and iconometry of divine figures in South India. He assembled scholars and experts in these subjects and then commenced the writing of the treatise. In parallel, he also assembled famed miniaturists from his palace and asked them to provide the accompanying illustrations. The final body of work brings together several forms of Shiva, Vishnu, Skanda, Ganesha, different goddesses, the nine planets (navagraha), and the eight protectors (aṣṭadikpālakas). Sritattvanidhi, the final work is in nine parts, and each part is called a nidhi (“treasure”). Krishnaraja Wodeyar III also wrote the illustrated epic prose-romance, Sougandhikaparinaya. It was a new prose style he devised, breaking away from the styles handed down until his time. The theme was neither borrowed nor adapted from any earlier work. However, it has a mythological theme written in the puranic style infused with puranic, Vedic and other epic characters like the sage Durvasa, and the God Indra. In true classical style, the work expounds on such diverse topics as philosophy, Yoga, astronomy, erotics, zoology, botany, music, horse and elephant-lore, horticulture, and even the digging of wells and lakes. 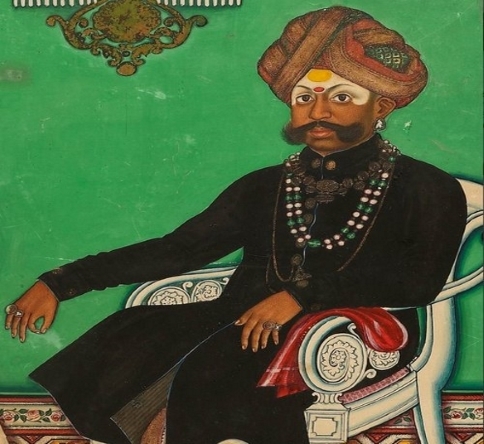 Another little-known exists about this liberally-illustrated work: the pictures in the book are from Krishnaraja Wodeyar’s lithograph press, which he had installed in the premises of the Mysore palace. He personally experimented with colour pictures. Of the most distinctive and unique regional dance forms in India hailing from Karnataka, Yakshagana (literally, song of the demigods) perhaps occupies the top spot. And its survival, resurgence and growth owes a huge debt of gratitude to Krishnaraja Wodeyar III. It was during his reign that he patronized Parti Subba, a renowned Yakshagana writer and performer from South Canara. This legacy has endured: the Karnataka state government, long ago instituted a Parti Subba award for Yakshagana artistes, a tradition that continues till date. Krishnaraja Wodeyar III was an accomplished player of the Veena and patronized great musicians and composers of his time like Sadashiva Rao, Veena Venkatasubbayya and Doddaseshanna. Like in other areas, it was under Krishnaraja Wodeyar III who created a sprawling cultural ecosystem where musicians received patronage, honour, and recognition for their talent and were able to live comfortably. This ecosystem existed even in the modern time all the way up to Mysore Vasudevachar in whose presence legendary contemporary musicians like M.S Subbulakshmi and M. Balamuralikrishna proved their mettle. Krishnaraja Wodeyar III also encouraged graphic arts. He had an army of accomplished artists under his patronage. Among other things, they were engaged to paint court-life in all its grandeur. Apart from this, portraiture developed as a fine art in Mysore during Krishnaraja Wodeyar’s rule. He had several portraits of well-known people of the kingdom painted by the best artists of the time. Along with the paintings of court life, these form a very valuable resource for researchers because of the visual clues they provide to the past. He was also responsible for the creation of the Jaganmohan art gallery of Mysore, and built the original building in 1861. The grandfather of the renowned K. Venkatappa (after whom the famed Venkatappa art gallery in Bangalore is named) was Krishnaraja Wodeyar’s personal friend. Krishnaraja Wodeyar III also introduced English education in the Mysore state by starting Maharaja’s English School which paved way for the famous Maharaja’s college and finally, the Mysore University later under Sir M. Vishweshwarayya. The nearly-70 year long rule of Krishnaraja Wodeyar III witnessed at least three generations of a galaxy of poets and other literary figures mainly in Kannada and Sanskrit. These litterateurs have stood the test of time, and their writings, plays, and poems are still read and recited in the state. Devachandra, Venkatarama Shastri, Basavappa Shastri, Aliya Lingaraja, Srinivasa Kavisarvabhouma, Thammaya Kavi, Nanjunda Kavi, Shantaraja Pandita, and Kempu Narayana are some of the more famous names. Of these, Basavappa Sastri perhaps stands tallest. He is still honoured with the titles of Abhinava Kalidasa (Modern Kalidasa) and Kannada Nataka Pitamaha (Progenitor of Kannada drama). He translated almost all the celebrated works of Kalidasa. Kempu Narayana wrote his celebrataed Mudra Manjusha (the Kannada version of Vishakhadatta’s Mudra Rakshasa), the play based on Chanakya’s life and achievements. Together, these litterateurs contributed to the development of modern Kannada prose, which had a style different from the Champu style of prose which in vogue till then. Other important literary works that emerged during Krishanraja Wodeyar’s rule include Kalavati Parinaya by Yadava and Vachana Kadamabari. Krishnaraja Wodeyar III was also an expert player of board games and is credited to have revived the Ganjifa card game, which originated in Persia. It was wildly popular during the Mughal rule. Perhaps one significant administrative decision he took was to transfer the capital city of the Mysore state from Srirangapattana to Mysore city. The original Mysore city had been razed to the ground earlier by Tipu Sultan. In closing, Krishnaraja Wodeyar III did not distinguish himself as a great administrator but his life and long rule indicates that it is possible to earn immortality by showing a humane side and encouraging refinement and culture like culture, art, music, and so on. Like most things in the history of India, it is unfortunate that not too many people today remember this foundational ruler of the Mysore state who gave it so much, and with such selflessness. Postscript: Excluding this postscript, the word count of this piece is 1799, as a mark of respect to Krishnaraja Wodeyar III who as a mere boy of five ascended the throne of Mysore in 1799. Was Narendra Modi the real target of MH 17 shooters?